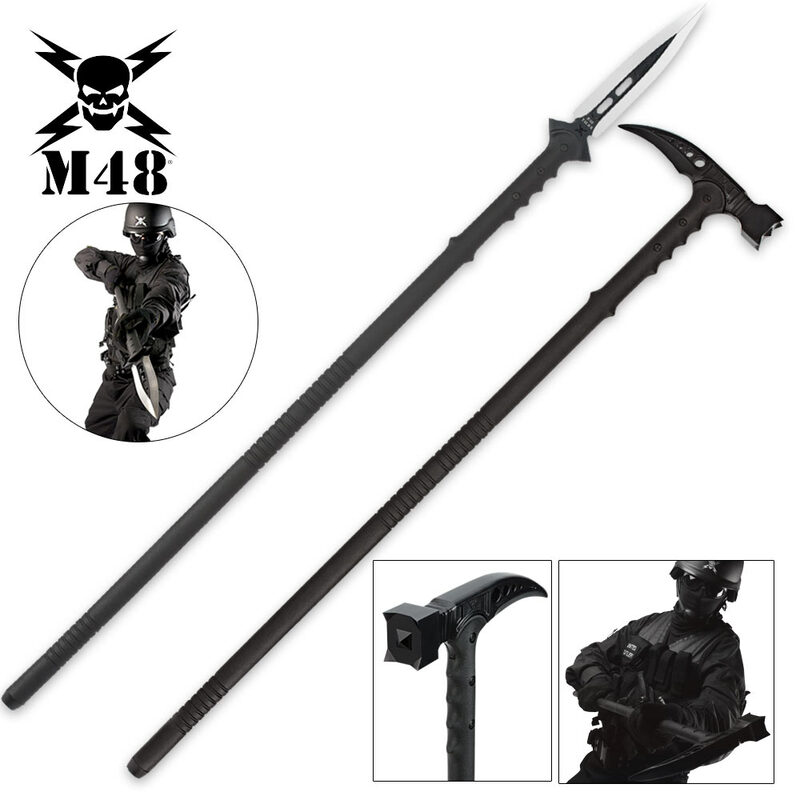 M48 Tactical Survival Hammer & Hunting Spear with Sheath Combo | BUDK.com - Knives & Swords At The Lowest Prices! You've been asking for it, and here it is! This exclusive combination deal offers you both of our hottest new M48 tactical survival items at one incredible price. These M48 Tactical accessories from United Cutlery are the perfect pair for hiking and camping, offering you tons of applications, durability, and powerful performance. Left a review with shopperapproved, but wasn't sure if it was spam (it wasn't), so I'm leaving a better one here. Needed a walking cane for medical reasons, but I'm no Joe Schmo gimp. I'm a young guy and I needed a mean piece. 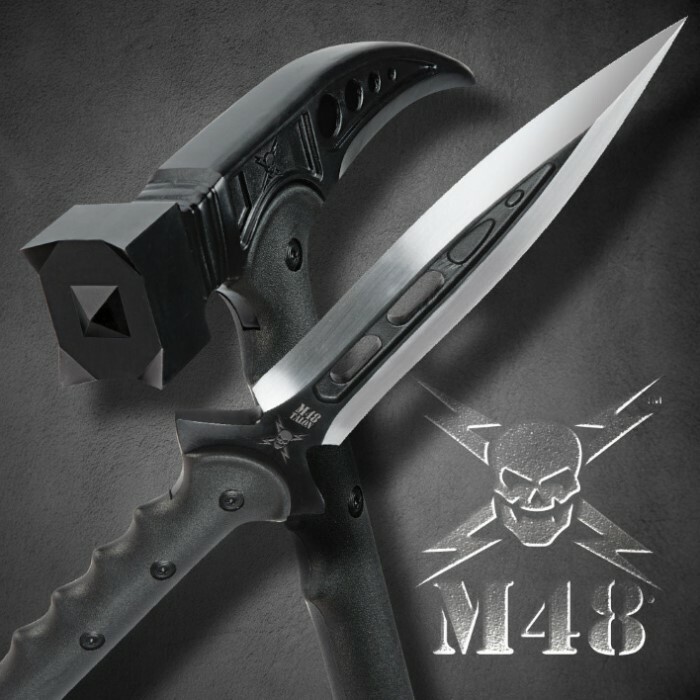 So I found the M48 Tactical War Hammer. It was exactly the length I needed and even advertised as a walking cane; not medical, but who cares, I'm a man. I found the M48 War Hammer alone on a competitors website for $160. Nay, nay. Never settle. Then I found CHKadels. They have a M48 War Hammer/ Spear combo for $10 cheaper. Done, son. Shipping was two days late, but not a deal breaker cuz it had tracking that kept me updated. Expected some rust on the hammer or spear, per other reviews, but mine were flawless, absolutely perfect. CHKadels even had a deal at the time, so got it all cheaper than expected. Ordering more stuff from them right now, cuz I'm that happy. The prices here are good enough i'm not even looking elsewhere, and I don't do that lightly. Keep it up CHKadels. You got my business. I bought this as a novelty, expecting to just have another cool conversation piece. Instead I got a pair of weapons that scream "take us hiking!" The hammer is perfect height for a walking cane. Both pieces fit perfectly in your hand and beg to be put to the test! These are very cool. The hammer is somehting else. It would be my first choice should I get into trouble. The hammer arrived with rust on the head and side. I will be sending it back and hope the replacement is not rusting. Customer support did not seem interested or suprised at the reporting of rust and require I send back the hammer and the spear together. In all honesty, I bought this thinking it would just be another stainless steel novelty weapon I would show off, and throw it in the box with the rest of my collection. I couldn't get over the smooth feel of the Fiberglas shaft, of both weapons, that made handling quick and precise. I mine quartz crystal for a living, and I decided to try the hammer out. To my amazement, the hammer did a better job busting rocks than my drop forged rock hammers. The Fiberglas handle isn't going to break, and the hammer head has a more focused blow. All force goes straight through the target instead of spreading outward. The spear is equally amazing. Again, the fiberglass shaft allows you to do things a wooden shaft won't. I like the size because it allows more maneuverability in a C.Q.C. Situation. Both weapons are super light and move faster than one might think. The spear can slide back and forth like a pool stick so fast, your enemy won't even know what hit em. It's pretty sick. Although they seem very light weight, and at first you might think not well made, these are awesome! The war hammer can be used as a cane that would provide a formidable self defense weapon should the need arise. The spear is a nice length but slightly too short for a walking stick if you prefer a taller staff style stick. I got them for casual hikes to be carried as " just in case " type tools. my wife is short so the spear would serve her well, while I prefer the hammer. These handles are nearly indestructible and the business end of each is very well done! The description on this page is somewhat mixed up, but the products are excellent, the hammer is weighted to produce a devastating swing and will shatter a windshield with little effort (yes i've done so, we have junk cars for parts) it also fits the hand well as a cane and is at a good height for me and i'm 6'4". as for the spear, it is insanely sharp. i haven't had occasion to try it out yet, but i plan to as soon as opportunity arises. all in all, this is an excellent deal.